Casey Minshew is the COO of EnergyFunders, a cutting edge Financial technology platform dedicated to disrupting the way people from all over the world invest directly into energy investments, starting with oil and gas. Casey has been a part of three successful startup companies, most recently growing startup iWowWe from zero to twelve million dollars in revenue in less than 2 years. During the show, Casey will explain the different types of oil investments that you can make including the potential returns. You’ll learn about the tax deductions you can receive and the key pros and cons of the oil business. Listen to the end for insight on the future of oil and energy resources. 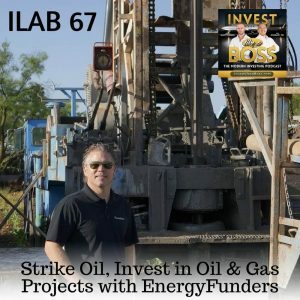 Listen to ILAB 67 on iTunes here or subscribe on your favorite podcast app. 01:04:23 – Are we making an investment? 01:12:24 – iTunes review shout outs!